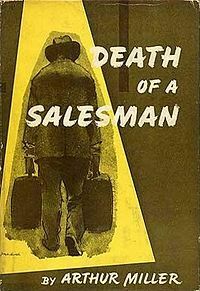 I haven’t read many modern plays (modern in the sense that it isn’t ancient or written by Shakespeare) so I wasn’t quite sure what to expect from Arthur Miller’s Death of Salesman. The synopsis I was given didn’t really appeal to me, because what is so exciting about an old man failing as a salesman? I quickly realized that my initial impression of this play was completely wrong, however- it’s about so much more than poor Willy! I didn’t think it was incredibly well written, beautiful, or anything like that, but the themes that the play focuses on are extremely thought-provoking and relevant even though it was written over sixty years ago. One can read or watch this play from so many different perspectives and angles, making it a great work to read with a class. For example, one theme is the impact of birth order on personalities and family dynamics. Biff, the oldest child, eventually assumes the responsibility for helping Willy because his younger brother, Happy, idolizes his father and is turning out to be just like him. This also connects with the idea that appearances aren’t everything, because Willy greatly values appearances but he is not a successful or productive worker. Willy’s sons have inherited these beliefs and bad work ethic as well, leading to more conflict and tension in the family. After seeing how his laziness has affected the family, Biff makes a conscious effort to improve his life. These themes were important in the 1950’s and continue to be valuable discussion topics in our society today. This play is about so much more than I originally thought, and it really makes you think about what you want to do with your life to be happy. Is it worth chasing after your dreams, or is it more beneficial to settle for a reliable job with fewer risks and better pay? At a first glance one might tend to agree with the latter, but this play honestly made me think twice about that initial impression. At a time in my life when I’m trying to decide where to go and what to do after high school, this book was quite influential and thought-provoking. Overall, Death of a Salesman is a tragic, heart-wrenching play about the ordinary lives of American families everywhere. It may seem like it is simply about an old man nearing the end of his life, but it also encompasses family dynamics, the “American Dream”, and what it really means to be successful. I believe that we can all empathize and connect with at least one character in this play, which really makes you question if you’re happy with the life you’re currently living. It’s deep stuff, but definitely worth thinking about! Have you ever read this play? What did you think of it? Would you rather be practical and get a well-paying job or follow your dreams despite all the risks? Let me know in the comments section below! Oh Wow!! I read this at 6 years ago in school. I hated it but I think it was just because I had to memorise quotes and write both and essay and an exam on it without having access to the book. Maybe I would feel different if I didn’t have to do such an in depth analysis of what Miller wrote. That’s too bad! I hate when English classes ruin books for people- there are so many opportunities to make people fall in love with books, and some teachers just ruin it every time. That happened to me with Shakespeare. I know I’d probably like it more if I read it one my own, but every time I try to I cringe thinking about my freshman English class! Anyways, I think Death of a Salesman is definitely worth reading! This is my first time hearing about Death of a Salesman but I’ll have to look into it! I haven’t exactly read any ‘modern plays’ before (although I have read some Shakespeare 😉 ) so I don’t know what to expect. The reliable job v. dreams question is quite a thought-provoker. Honestly, I’m undecided. If there was a way to do both, I’d go for it, but when push comes to shove I’m not sure. It’s such a difficult question to answer! I feel the same way. I think the best jobs are when the two answers collide: reliability and financial stability mixed with the thing you’re most passionate about. That would be amazing!